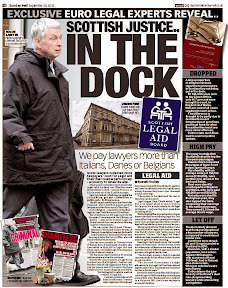 Questions of judicial integrity as former top prosecutor steps aside in case THE FORMER Lord Advocate who prosecuted two Libyans for the bombing of Pan Am flight 103 over Lockerbie, Scotland in December 1988 now features among a list of judges who have been required to step aside (recuse) in cases where conflicts of interest have come to light. 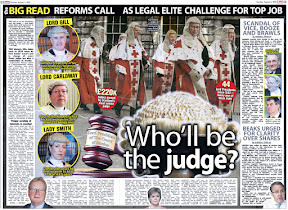 Lord Colin Boyd – who was Scotland’s top law officer from February 2000 to October 2006 and is now a Court of Session judge – recused – or- stood down from a civil case earlier this month due to the fact one of the respondents involved was convicted of offences while Lord Boyd was Lord Advocate. The term “recusal” relates to where a judge can or should be disqualified from participation in the decision in a case, for reasons such as a conflict of interest such as a link to any party involved in a court hearing, or a financial or personal interest in the outcome of a court case. 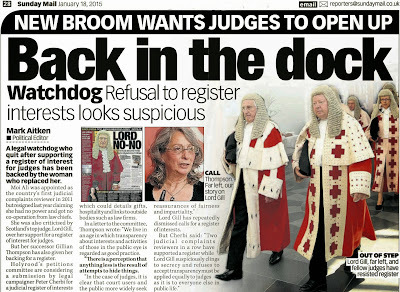 The details – minus any actual reference to the case itself - came to light in recent additions to the ‘recusal register’ – now required to be published by the Scottish judiciary after undertakings were given by outgoing top judge Lord Gill to msps who are investigating calls for a register of judicial interests as called for in Petition PE1458: Register of Interests for members of Scotland's judiciary. 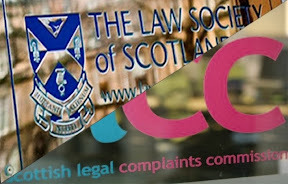 The proposals under investigation by the Scottish Parliament call for the creation of a single independently regulated register of judicial interests containing information on judges backgrounds, their personal wealth, undeclared earnings, business & family connections inside & outside of the legal profession, offshore investments, hospitality, details on recusals and other information routinely lodged in registers of interest across all walks of public life in the UK and around the world. 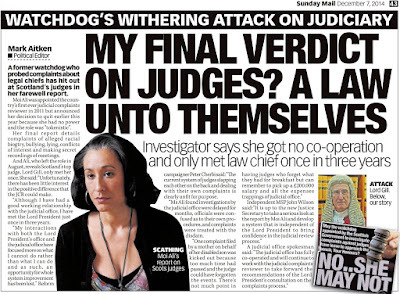 However - despite the fact Scotland’s judges take home a whopping £30.6 million pounds a year in judicial salaries and other perks - not one judge has revealed or declared a financial related conflict of interest. 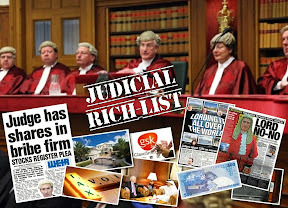 The lack of financial related recusals has raised questions as to whether judges are telling the truth in court after details have emerged over the past two years of staggering wealth, secretive links to big business, judicial participation in offshore tax avoidance schemes and property empires – all leading back to the judiciary. 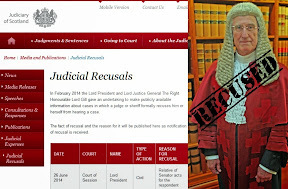 Among those in the judiciary snared on the year old list of recusals - outgoing Lord President Lord Brian Gill was forced to step aside in a case after his own son – Brian Gill junior appeared in the Court of Session representing one side in a civil case. 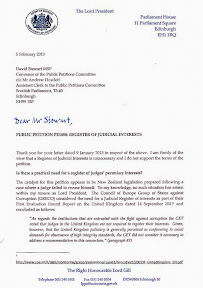 An example of where a failure by a judge to recuse himself from a miscarriage of justice appeal reported Mr William Beck - who was convicted of an armed robbery in 1982 and has been fighting a long battle to clear his name since, had his appeal against conviction thrown out by Lord Osborne. Lord Osborne failed to declare in court he prosecuted him in the original cases all those years ago while working for the Crown Office. A letter containing evidence provided by Mr William Beck to the Scottish Parliament reveals how one judge, Lord Johnston, failed to declare any interest or recuse himself from an appeal by Mr Beck against a wrongful conviction & sentence handed down by Lord Dunpark - who was Lord Johnston’s father. 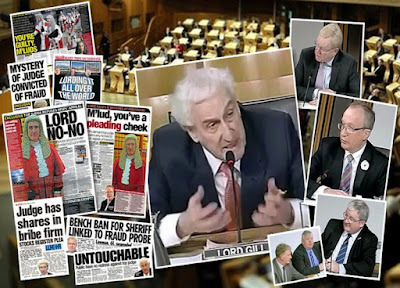 Mr Beck’s submission to MSPs also revealed, Lord Osborne, who sat with two other judges and rejected another appeal by Mr Beck against his wrongful conviction, failed to disclose that he was the prosecutor in the original trial of Mr Beck. 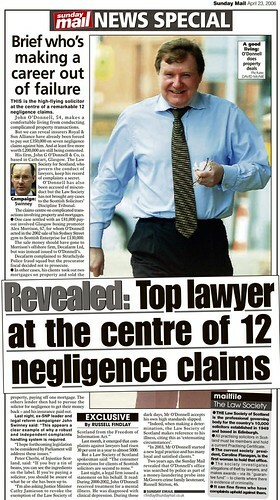 When asked by the Sunday Mail newspaper why he did not recuse himself at the time, Lord Osborne claimed he forgot. 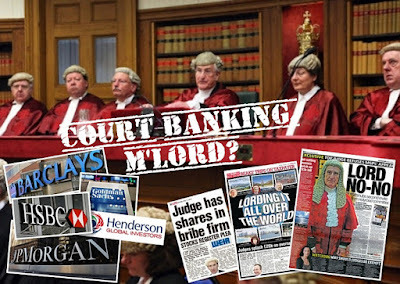 No action has been taken against Lord Osborne over his failure to recuse in the Beck case, and a number of other cases in Scotland’s courts are now coming under suspicion of being ruled upon by judges with vested interests in the outcomes of cases. 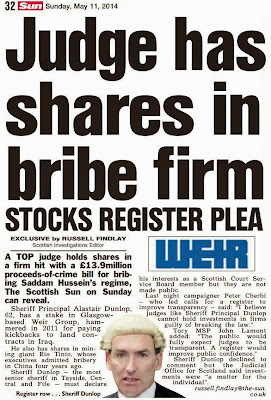 And, earlier this year, a sheriff was suspended by Scotland's top judge after the Scottish Sun newspaper reported details of a multi million pound writ against Glasgow law firm Levy & Mcrae in connection with the collapse of a £400 million hedge fund. 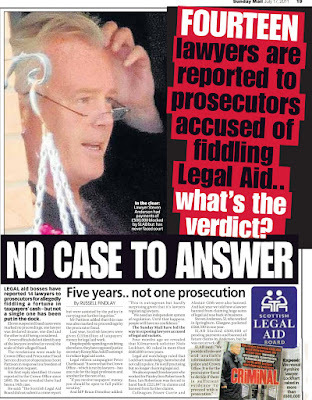 However, it emerged the suspension of Sheriff Peter Black Watson – formerly of Glasgow based law firm Levy and McRae - only came about after journalists from the Sun newspaper contacted the Lord President Lord Gill’s office and queried him about the writ – which Gill had allegedly not heard of until the media drew it to his attention. 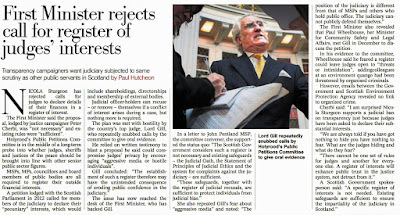 A few days later, Lord Gill suspended Sheriff Peter Watson after concluding Watson’s offer to voluntarily step aside was “not appropriate and that suspension was necessary in order to maintain public confidence in the judiciary”. On Monday 16 February the Lord President considered the matter. 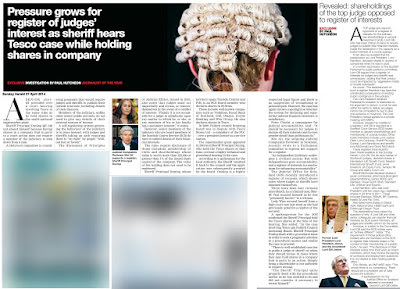 Having been shown the summons, the Lord President concluded that in the circumstances a voluntary de-rostering was not appropriate and that suspension was necessary in order to maintain public confidence in the judiciary. 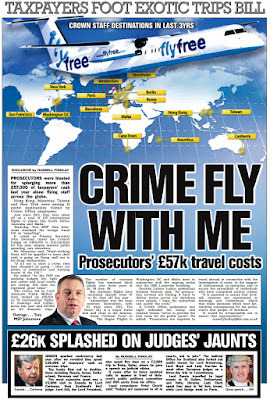 The Scottish Sun previously reported on a dossier handed to prosecutors which focussed on Glasgow-based Mathon Ltd – which Watson was a director of - from 2007 to 2011. 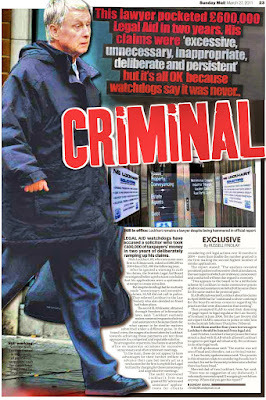 Mathon was linked to the failed £400m Heather Capital hedge fund run by Gregory King. 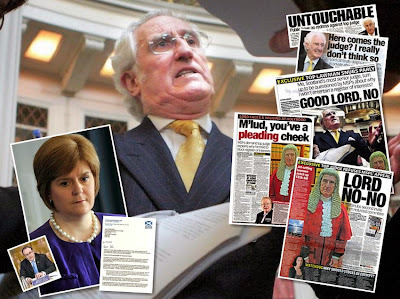 The collapsed hedge fund Heather Capital – run by lawyer Gregory King is now the subject of a Police Scotland investigation and reports to the Crown Office. Gregory King is named along with three others – lawyer Andrew Sobolewski, accountant Andrew Millar and property expert Scott Carmichael in a police report. A judge in the Isle of Man has said it is likely that "fraudulent conduct exists”. 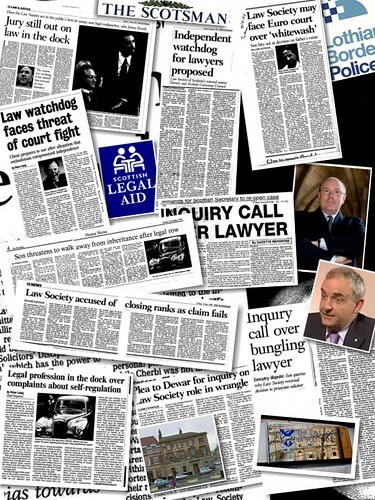 Proposals currently under investigation by the Scottish Parliament call for the creation of a single independently regulated register of judicial interests containing information on judges backgrounds, their personal wealth, undeclared earnings, business & family connections inside & outside of the legal profession, offshore investments, hospitality, details on recusals and other information routinely lodged in registers of interest across all walks of public life in the UK and around the world. Sheriff drew to the parties’ attention a possible difficulty, namely the wife of one of the other resident Sheriffs was the author of a report contained with the process. The Sheriff asked parties if they wished him to recuse himself. The defenders, having considered the issue, made a motion for the Sheriff to recuse himself, which he then did. 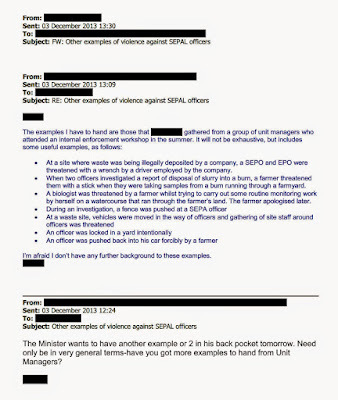 Sheriff drew to parties’ attention that she was a member of the RSPB before commencement of a trial as the case involved an investigation carried out by the RSPB and many witnesses were RSPB officers. She invited parties to consider whether she should take the trial. The defenders, having considered the issue, made a motion for the Sheriff to recuse herself, which she then did. Contemporaneous and overlapping proceedings comprising an appeal and a referral from the children’s hearing relating to children from the same family. Senator personally known to parties of the action. Top judge who resisted transparency praised for long career. 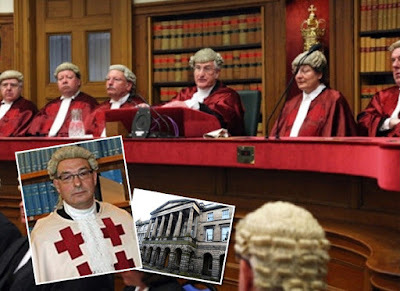 FAREWELL tributes have been paid in court today to Scotland's top judge, Lord President Lord Brian Gill as he retires after serving three years as Lord Justice General, accumulating some 21 years on the bench. 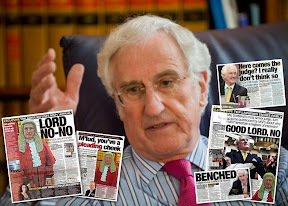 Brian Gill – now aged 73, was Lord Justice Clerk from 2001 until 2012 when he was appointed Lord President after the retirement of Lord Hamilton. At a ceremony earlier today in the First Division courtroom in Parliament House, a full bench of judges heard Lord Carloway, the Lord Justice Clerk, say that Lord Gill's legal career had spanned half a century and "his distinguished path from passing advocate in 1967 to Lord President is a matter of record if not legend". 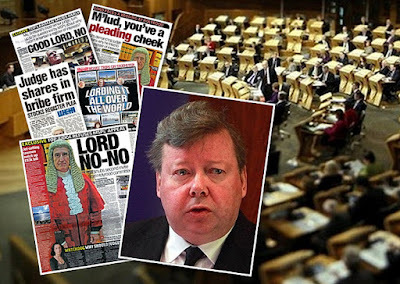 Lord Carloway added: "We will all miss his leadership and his friendship on and off the bench. He will be a great loss to Parliament House. However, on behalf of the bench and staff, we all wish him well in retirement, knowing he has a life beyond the law." 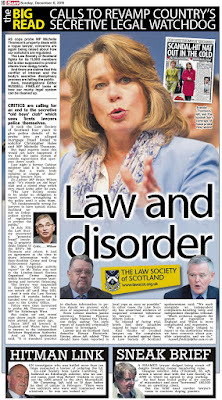 Gill had a vision of an inclusive approach, along with a deep concern for the common man and woman, said Lord Carloway - who only a few weeks ago gave a speech accusing lawyers of derailing his own plan to abolish corroboration – a safeguard in Scots law where evidence must be corroborated by two independent sources. 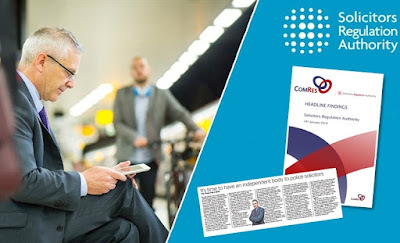 Speaking at a conference of Commonwealth Law Reform Agencies in Edinburgh, Lord Carloway said that his proposals to abolish corroboration has been met with “real hostility” from some lawyers. As it turns out, Lord Gill, along with just about every other member of the judiciary opposed the removal of corroboration. In November 2013, Lord Gill gave testimony to the Scottish Parliament’s Justice Committee who were considering the abolishment of corroboration. 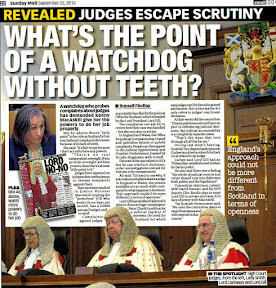 Subsequently, the Justice Committee voted against abolishment of corroboration and the politically motivated plan to abolish it – led by the Crown Office, Police Scotland and the now sacked Justice Secretary Kenny MacAskill - was thankfully abandoned. 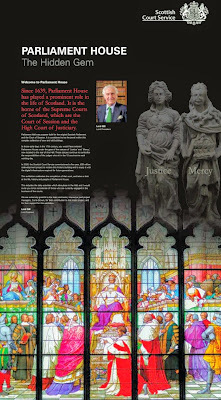 James Wolffe QC, Dean of Faculty, praised Lord Gill's commitment to Scotland's outward-looking legal heritage. Wolffe – who’s wife is Court of Session judge Lady Sarah Wolffe – referred to court reports of the past 20 years as "filled with your judgments, expounding and applying the law in your characteristically lapidary prose". Mr Wolffe - who heads the Faculty of Advocates – the governing body for advocates recently revealed to have plundered the land titles to Parliament House - added: "Your presidency of this court has been characterised by a major campaign of civil justice reform... it aims to effect nothing less than a transformation in the way that we secure civil justice in this country in the 21st century." Referring to music - another of Lord Gill's great passions, Wolffe recalled that he had written an anthem, "Populus Sion", for the Faculty of Advocates Choir which was performed by the choir, under his direction, in the Basilica of St Peter in Rome in 2006. Wolffe added: "I speak on behalf of the Faculty, as its Dean, in expressing the hope that, as the law releases its claims upon you, as you lay aside the burdens of office, you will find great enjoyment doing the things about which you care and spending time with the people whom you love"
Alistair Morris, President of the Law Society of Scotland, hailed Lord Gill as one of the most distinguished, pragmatic and reforming holders of the offices of Lord Justice Clerk and Lord President. 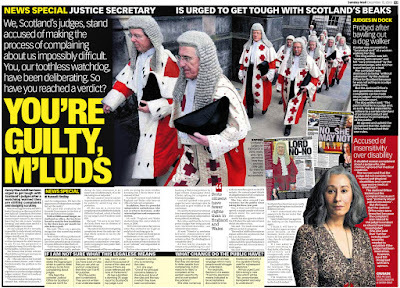 Morris, who recently wrote in the media about a rigged Law Society poll claiming lawyers were well regarded - said Gill had brought great judgment to the posts, and, importantly, "Glaswegian wit and good humour." 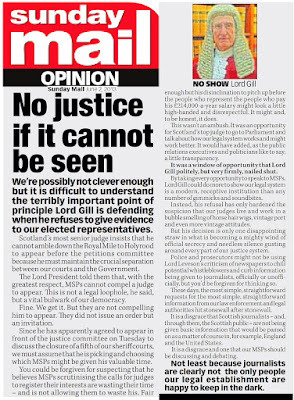 Lord Gill, who devised the sweeping, now sadly watered down reforms to the civil courts as authored in his Scottish Civil Courts Review - thanked everyone for their kind words, which "mean more to me than I can say". He said he had enjoyed two great privileges in his career. The first was to be admitted to the Faculty of Advocates, through which he had the good fortune to make a living doing what he loved, and to make "many and lasting friendships through the camaraderie of the bar". The second was to have been appointed to the bench, and over 20 years he had been learning all the time from his colleagues and from the gifted pleaders who appeared in his court. Gill said: "To have been Lord President has been an honour. I have tried to live up to the responsibilities of the job in a fitting way... to enhance the reputation of the court... and to make the work of my colleagues more congenial and fulfilling.I leave office with only the happiest of memories of my time as a pleader and my time as a judge." 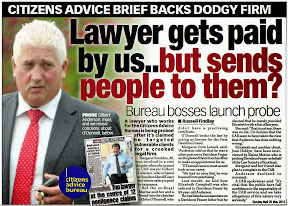 On the thorny issue of judicial declarations, legal insiders outside court praised Gill for his input on a proposal calling for judges to declare their secretive wealth, connections and links to big business. 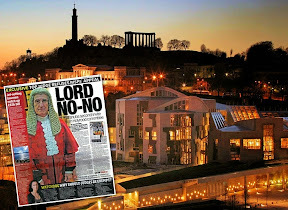 In response to calls from MSPs to attend the Scottish Parliament, the top judge fired off a barrage of angry letters and refused at least three invitations to face MSPs in public and face questions on his hostility to judicial transparency. 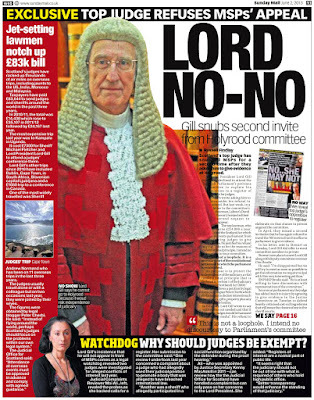 The saga led to Gill receiving the nickname Lord No-No. 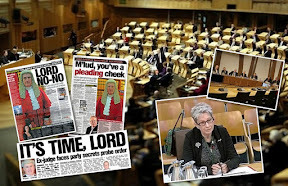 At a recent hearing of the Scottish Parliament’s Public Petitions Committee, one MSP said Gill had protected vested interests of the judiciary during a two year probe on judicial transparency & accountability. 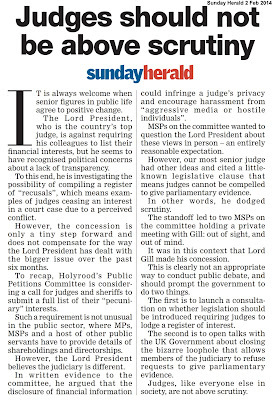 Holryood probe on judicial transparency hits out at top judge MSPs who sit on the Scottish Parliament’s Public Petitions Committee have resisted calls by First Minister Nicola Sturgeon and Scotland’s outgoing top judge Lord President Lord Brian Gill to close down a long running investigation of transparency and accountability within Scotland’s mega rich, mega powerful & secretive judiciary. 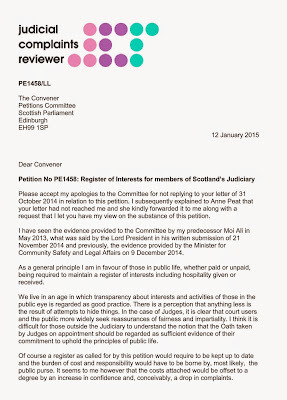 In the latest hearing of a proposal to create a register of interests for judges as called for in Petition PE1458: Register of Interests for members of Scotland's judiciary, members of Holyrood’s Public Petitions Committee instead criticised the 73 year old top judge for protecting vested interests. Mr Carlaw also suggested there could be “more enlightened engagement with the Lord President’s successor”. 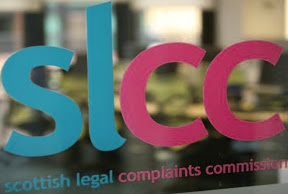 At the meeting, held last Tuesday, the Petitions Committee considered the latest evidence including an intervention by the First Minister, letters from Lord Gill, the petitioner and Gillian Thompson - the Judicial Complaints Reviewer. 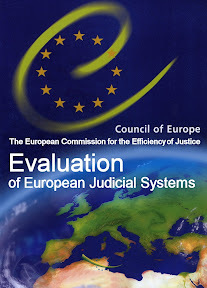 Concluding the brief debate, members of the Petitions Committee decided to invite Gillian Thompson, Scotland’s current Judicial Complaints Reviewer (JCR) to give evidence on the long running probe on judicial interests. 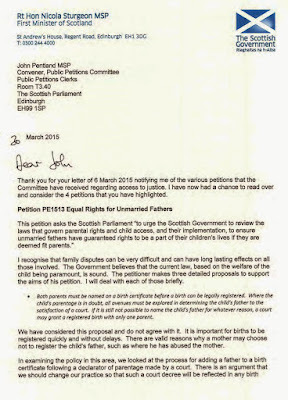 The Convener (John Pentland MSP, Scottish Labour): The next petition is PE1458, by Peter Cherbi, on a register of interests for members of the Scottish judiciary. Members have a note by the clerk and the submissions. I invite contributions from members. Kenny MacAskill MSP (SNP): I think that it would be appropriate to hear from Gillian Thompson, the new Judicial Complaints Reviewer. She is a fresh pair of eyes and asking for her reflections in her new role may give us some insight. The Convener (John Pentland MSP, Scottish Labour): Does everybody agree with that? Are there any other comments? 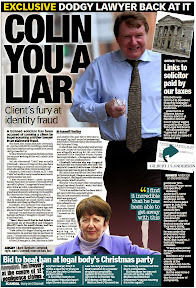 Jackson Carlaw MSP (Scottish Conservative): I agree with Mr MacAskill. I understand that the Lord President is due to retire in due course, and we will wish him well. He will leave knowing that he has managed to protect all the vested interests that he has so assiduously sought to represent in the conduct of this petition. As we will be hearing from Gillian Thompson, who is new to her position, it may even be that there will be more enlightened engagement with the Lord President’s successor, so I am all for keeping the show on the road. The Convener (John Pentland MSP, Scottish Labour): As many people do, I recognise that the existing safeguards are robust, but are they sufficient? The problem is that the public cannot see that they are robust, even though that may well be the case. 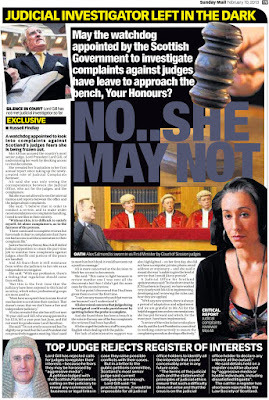 I think that inviting Gillian Thompson in to give evidence would be appropriate. Do members agree to take the action proposed? 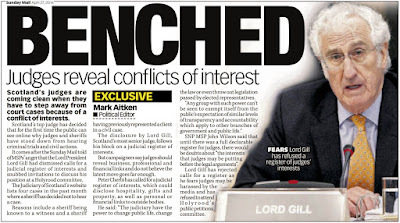 Previously, Lord Gill refused several invitations to appear at the Public Petitions Committee to account for his opposition to creating a register of judicial interests. 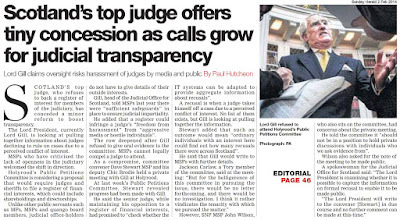 The top judge sent a series of angry letters to msps, declaring there would be no judicial transparency or a register of interests during his term as Lord President. 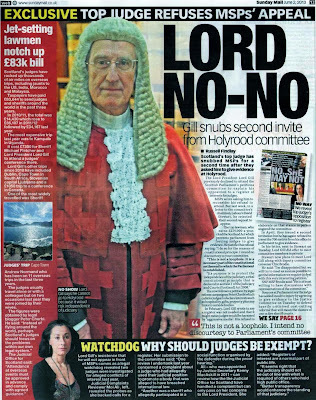 In a bid to dodge attending an evidence session at Holyrood to face questions in public from msps, Lord Gill angrily claimed a loophole in the Scotland Act prevented msps from compelling a judge to attend a Holyrood Committee. 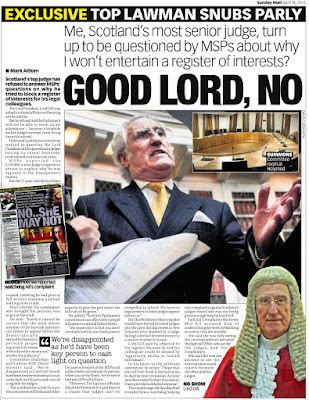 Lord Brian Gill, Scotland’s longest serving judge went on to fight a bitter two year battle against the proposal to require judges to declare their vast wealth & business connections. 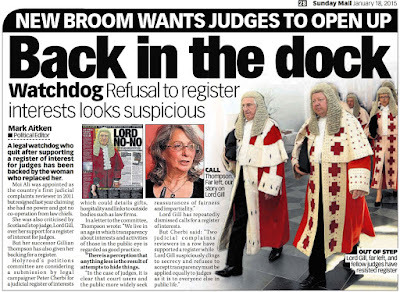 Now, Gillian Thompson OBE – Scotland’s second Judicial Complaints Reviewer will face MSPs in a future evidence session at Holyrood. The JCR is already on record as supporting the creation of a register of interests for members of the Judiciary. In earlier written evidence to the Public Petitions Committee, Gillian Thompson wrote of her support for the proposal, and indicated she too had created her own register of interests for her role as judicial investigator. 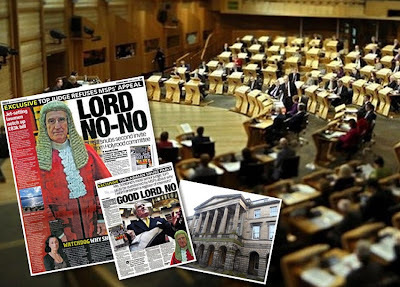 MSPs held a full debate on calls to create a register of interests for judges - in the Scottish Parliament’s main chamber on Thursday 7 October 2014, resulting in cross party support for the proposal. MSPs overwhelmingly supported motion S4M-11078 - in the name of Public Petitions Convener David Stewart MSP on petition PE1458, urging the Scottish Government to give further consideration to a register of interests for judges. 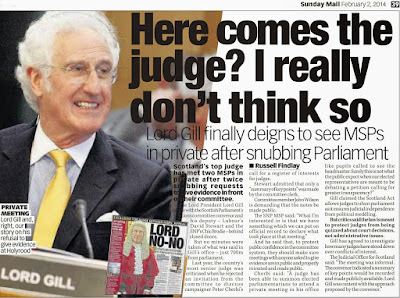 Lord Gill hosted taxpayer funded posh party for court refit. 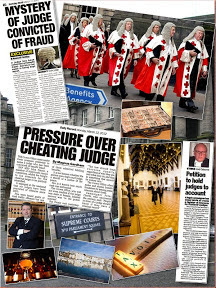 SCOTLAND’S top judge celebrated a £58million taxpayer funded refit on the Court of Session by holding a £36K exhibition and party which included trumpeters, archers and a get together for senior political figures and members of Scotland’s legal establishment. 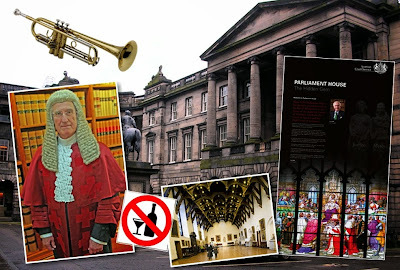 However, Lord President Lord Brian Gill, 73, banned guests from drinking alcohol to toast the refit of Parliament House – Gill’s seat of power in the Royal Mile. 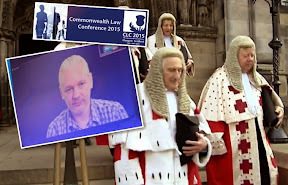 Documents obtained via Freedom of Information legislation show worried court staff debated whether they could obtain favourable press coverage for the event – which was held close to the independence referendum. Principal court clerk Graeme Marwick asked Lord Gill about the possibility of alcohol being served to guests who included the Lord Advocate, top politicians from the Scottish Government and figures from the church. However, Gill said No. 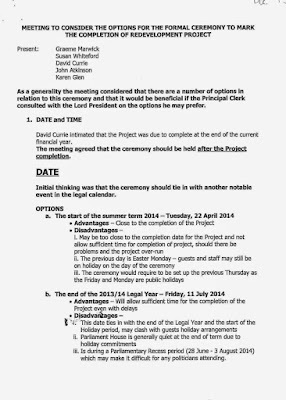 The minutes of the discussions arranging the party reveal court staff worries that guests would not be able to meet and interact without a glass of wine. 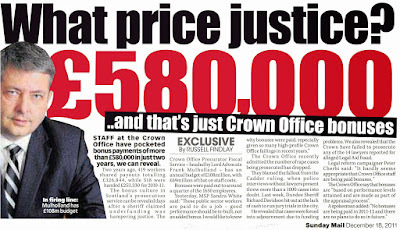 Lord Gill agreed to spend £750 hiring trumpeters from Glasgow's Royal Conservatoire. Gill is also a trustee of the Royal Conservatoire, based in Glasgow. To the sound of music and political chatter, guests of the Lord President’s taxpayer funded bash were eventually treated to soft drinks and canapés – costing £3,620. Hosting the event, Lord Gill also unveiled a brass plaque marking the major refurbishment of the sprawling Parliament House site, comprising of some 700 rooms within the sprawling complex of buildings. However, speeches given by politicians and legal luminaries at the event failed to mention concerns which have now surfaced relating to who actually owns which parts of the Parliament House complex - which has since been in the news after it had been discovered Scottish Ministers had gifted some of the titles to the Faculty of Advocates. 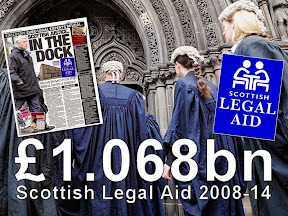 It transpired the Faculty of Advocates had in-fact, lobbied the Scottish Government to hand over ownership. 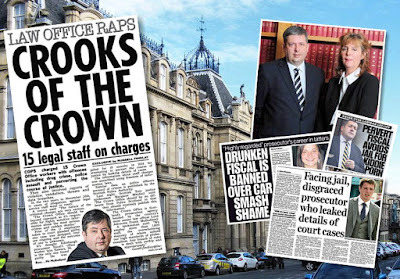 A trove of eighty eight pages of documents obtained from the Scottish Government under Freedom of Information legislation later revealed Scottish Ministers plan to do nothing over their handing over of the Parliament Hall land titles to the Faculty of Advocates. 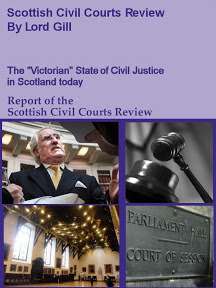 Throughout the documents – which contain communications between civil servants, briefings to Ministers, land reports and letters from Edinburgh City Council asking for meetings, it is clear Scottish Ministers favour leaving the titles to the nation’s top courts with the vested interests of the legal profession. During a First Minister’s Questions session at Holyrood, Nicola Sturgeon was asked by Alison Johnstone MSP (Lothians, Green Party) about the Parliament Hall land grab by the Faculty of Advocates. 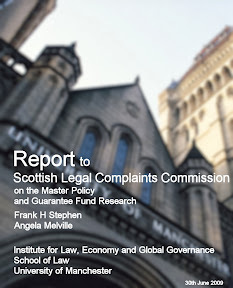 In her reply, featured here: Parliament House handed over to Faculty of Advocates FMQ's Nicola Sturgeon 19 February 2015 Nicola Sturgeon claimed she found no fault on the part of the Scottish Government - who handed over the titles to the Faculty of Advocates – effectively little more than a lawyer’s lobby group. 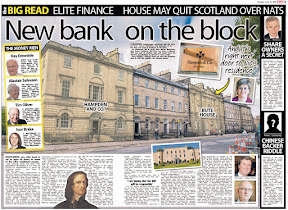 The First Minister went on to warn “ there is no easy solution to the issue of restoring title to the City of Edinburgh Council” without giving a real explanation of why the titles were transferred in the first place. 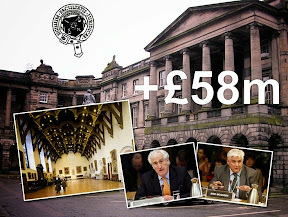 Taxpayers not invited to Gill’s £36K bash got an informative leaflet on the £58million public spend on Parliament House. 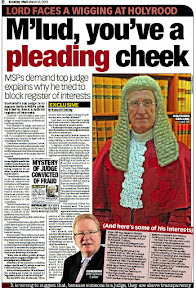 During the summer of 2013, Scotland’s top judge Lord Gill – head of the Scottish Court Service Board, and the Scottish Court Service Chief Executive Eric McQueen appeared before MSPs at the Scottish Parliament’s Justice Committee to give evidence on court closures and the millions spent on Parliament House – yet neither the judge nor the Courts chief mentioned their astonishing secret to the MSPs present – that the title to Scotland’s highest court buildings had been swiped by the Faculty of Advocates in a deal on the sly with Scottish Ministers. 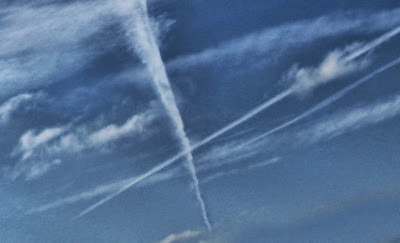 Look up, and you can see Scotland from anywhere in the UK. SCOTLAND should have a strong voice at Westminster. That much is certain. We are a berth for the UK’s nuclear submarines. We build the ships of the Royal Navy. We are so popular (and important) bears fly off our coasts and sneaky submarines sneak around our fishing boats. We contribute to the UK’s economy and the fabric of the country as a whole (regardless of the denial brigade) so much, London could never bear to let us go. It’s true! 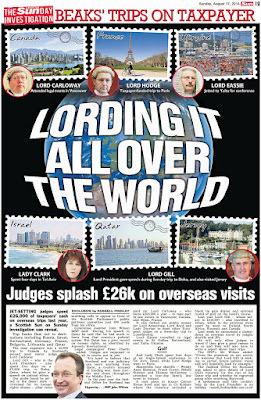 And – yes - we house a collection of 700 year old judges hell bent on protecting their highly secretive and dubiously achieved judicial wealth from prying eyes. It is also true our little, big, country is a possible candidate for vested interests & big business to frack for their own gain. Yes, their gain, not the wider community at large. Vested interests, corporate boards and Chief Executives do not toast champagne over throwing free money at citizens or vital public services without some fiddle in the background. Fact. And – sadly - we are an outpost of dodgy financial & legal services who go to extreme efforts to avoid scrutiny, accountability, regulation & transparency. Heather Heather. And some Capital. In any case, there is a General Election this Thursday, and it is your right as a citizen - to vote. Will anything change next week? Not really. The NHS will still be in crisis. Statistics on crime (and everything else) will still be fiddled beyond plausibility. Increasing numbers of people across the UK will be forced to use Food Banks. Oh .. Shocker. People in power you rely on for help will write back to you saying they cannot help. 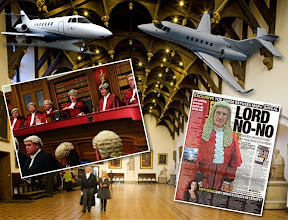 Lord Gill – the Lord President & Lord Justice General - almost Napoleonic in title, will still be in Parliament House dancing to “Mysterious Ways” – or perhaps “Insidious Ways” - gaming out his latest military style exercise against judicial transparency on his WOPR WarGames computer. Oh yes – and the rich get richer while the poor get poorer. But, once every few years - when you – the electorate – are needed - it is YOUR chance to hold Government and all it’s fantasy and all it’s power – to account. As you hold Government to account this week with your vote - think on this. Some might say … a Government is only as good as it’s opposition. Inevitably, a Government is only as good as those who vote for it. A strong opposition can - or at least should - hold a Government to account. A strong, independent media often holds, and frequently advances the line on transparency and accountability - which helps hold Government to account. Thursday 7 May 2015 is your choice, your voice, and your vote. Think. Don’t be bullied by vested interests or false and fantastical promises. However you decide to vote, you have the right to decide for yourself. But please, do vote.